Co-Director of The Fairfield Foundation, Dave has a PhD in History from The College of William and Mary and an M.A. in History/Historical Archaeology from The University of Massachusetts at Boston. He has taught and worked in the field of archaeology since 1994, including five years with the Colonial Williamsburg Foundation. Dave helped start and co-owns DATA Investigations LLC, a cultural resource management firm based in Gloucester County and is a founding member of the Werowocomoco Research Group, conducting research on the future national park property since 2001. Thane is co-Director of The Fairfield Foundation and has an M.A. in History/Historical Archaeology from The University of Massachusetts Boston. He is also owner of DATA Investigations LLC, a cultural resource management company. He runs multiple archaeological projects, including large-scale excavations focused on the Middle Peninsula and Northern Neck of Virginia. Thane is a founding member of the Werowocomoco Research Group, conducting research on the future national park property since 2001. Take this opportunity to support conservation at the Fairfield Plantation. The Fairfield Foundation, a non-profit organization, is dedicated to archaeological and historical research, public education and preservation in Gloucester Country. Centered at the 17th- and 18th-century plantation and ancestral home of the Burwell family, Fairfield, the foundation contributes to knowledge of plantation life and supports the preservation of historic resources within the region. Review the materials in the Fairfield Plantation Education Portal and learn more about the site and ongoing archaeological investigations and conservation efforts. Learn the latest 3D technology as you help The Fairfield Foundation with archaeology and preservation fieldwork. Experience the thrill of using innovative technologies to re-discover history at Fairfield Plantation. Continue exciting work to create a three-dimensional model of the plantation using tools from trowels to drones. Fairfield was home to one of Virginia’s magnificent manor houses, once surrounded by 7,000 acres of tobacco fields and forestland at the heart of Gloucester County, just north of Williamsburg. You can join the community effort to uncover and digitally record, recreate, and reimagine the historic landscape at Fairfield Plantation. David and Thane are so knowledgeable and create such a fun, engaging atmosphere. I did think going a second time would be kind of a repeat. Boy, was I wrong! You can’t dig with those guys and not learn something new. Five generations of the Burwell family lived at Fairfield, designing the landscape and controlling the environment for their own benefit. Their story includes the lives of many enslaved Africans and African-Americans who were forced to labor for the Burwells’ financial success, but experienced a very different and fascinating life of their own. Documentation of the site began in August 2017 with a drone-based photogrammetry survey, which stitches together hundreds of photographs to generate a highly accurate and detailed digital model of the site. In an unprecedented step, the Fairfield Foundation is now using 3D printers to create a highly accurate replica of the site based on the digital model. Each soil layer exposed during excavation will be printed individually so that students and visitors can take the model apart and experience the same process of discovery that archaeologists do. The manor house, largely destroyed in the 1897 fire, will also be digitally recreated and included as a component of the printed model. You and other volunteers will learn 3D technologies and assist with ongoing excavations. Your work will be represented in the model! 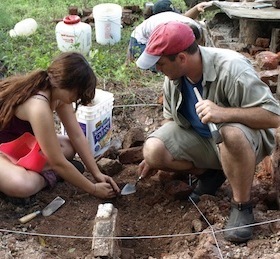 The Fairfield Foundation relies heavily on volunteers like you to help with excavation and cataloging of archaeological finds and architectural fabric as these are uncovered. The Fairfield Foundation is dedicated to involving the community in their efforts to discover and preserve local history. They provide hands-on activities, such as public dig days and Tuesday lab night, for people of all ages who want to experience an archaeological dig or help preserve and restore historic structures. Volunteers like you are helping uncover fascinating glimpses into a world seldom recorded in historical documents. Excavations are revealing the long-lost layout and design of the manor house and clues to the location and layout of slave cabins. Each bit of work furthers research into the site’s complex history, helping future visitors better understand the plantation era. Your work will help archaeologists share the thrill of discovery, while also creating a detailed digital record of the site. Out-of-town jammers stay at the Hampton Inn in Gloucester, and eat breakfast at the inn. Lunches are provided either on-site or in town as a mid-day break. Dinners are at your own expense, but we pick several of Gloucester’s great restaurants and go as a group. A special Resident Rate of USD250 is available for Fairfield Foundation members and residents of Gloucester County. The standard fee for the week is USD940 for lodging in a double room, or USD1190 for a single room. The Student Rate, for current students not requiring lodging, is USD250. Scholarships are available to cover student lodging on a first-come, first-serve basis. The scholarship is provided through hosting by community members. For students who need lodging and do not get a scholarship, the fee is USD680 for a double room, and USD930 for a single room. To qualify for a scholarship, please email AiP a short essay explaining what you hope to gain from the week. Following your week at the plantation, you must provide a description of your week to be posted on social media, sharing your experience. AiP excursions broaden your volunteer experience, adding to the adventure and giving you a greater understanding and appreciation for the region’s history. We will take a walking tour of the Gloucester Courthouse Circle and the Downtown Historic District and visit the adaptive re-use project at the 1930 Edge Hill Service Station, now the Fairfield Foundation’s Center for Archaeology, Preservation and Education (CAPE). Day trips change each session, but may include a trip to the brickyard at Colonial Williamsburg; the magnificent Rosewell ruins, where Thomas Jefferson was a frequent visitor; Bacon’s Castle, the oldest brick dwelling in the US; or historic Jamestown. spent an amazing week with wonderful people and I would recommend everybody to live this unique experience. If you are arriving by air, airport pickup is available at Newport News/Williamsburg International Airport. Often less expensive, yet relatively close alternatives include Norfolk International and Richmond International, both 90 minute drives. Pick up is not available at Norfolk or Richmond, but rental cars are available at each destination. Temperatures are usually quite warm and humidity levels may be high. Shorts or jeans with a t-shirt work well. Closed toed shoes are required. Be sure to bring sunscreen, bug repellent and a water bottle. Read about previous years’ adventures with this volunteer archaeology project at Fairfield Plantation and make plans to join us this year.